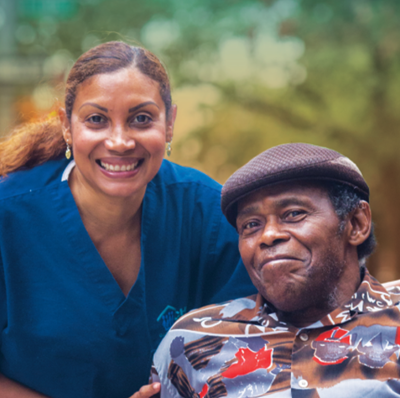 Loretto is a comprehensive, continuing health care organization that provides a variety of services for older adults throughout central New York. Its system of care has 19 specialized programs in Onondaga and Cayuga counties, ranging from a large Program of All-Inclusive Care for the Elderly (PACE) program to skilled nursing facilities. Today, Loretto serves nearly 9,000 individuals each year through its extensive network of services. PHI has had a multi-year partnership with Loretto, beginning by supporting its PACE program to implement peer mentoring and then expanding our support to its residential services. PHI worked with Loretto Health and Rehabilitation Center, a long-term care skilled nursing facility and short-term residential rehabilitation program in Syracuse, NY, to facilitate leadership workshops, develop a peer mentoring program, and deliver a train-the-trainer workshop that built training capacity among staff. To date, this project has impacted approximately 500 supervisors and direct care workers. Currently, PHI is working closely with Loretto’s Commons on St. Anthony, a skilled nursing and short-term rehabilitation community in Auburn, NY, to implement a range of leadership development, relationship-building, and communication skills training for staff, as well as a peer mentoring program, to improve staff stability at the residence.